Ten dollars of each hat sold is donated to Education Through Music! Exclusive cord available in ETM’s signature purple. Ten percent of each bracelet sold is donated to Education Through Music! Ten percent of each bracelet sold is donated to Education Through Music! Ten percent of each necklace sold is donated to Education Through Music! Ten percent of each earring set sold is donated to Education Through Music! *NEW* A Music Teacher Made a Difference in my Life. Available in all sizes. *NEW* A Music Teacher Made a Difference in my Life. *NEW* Sometimes B#. Available in all sizes. 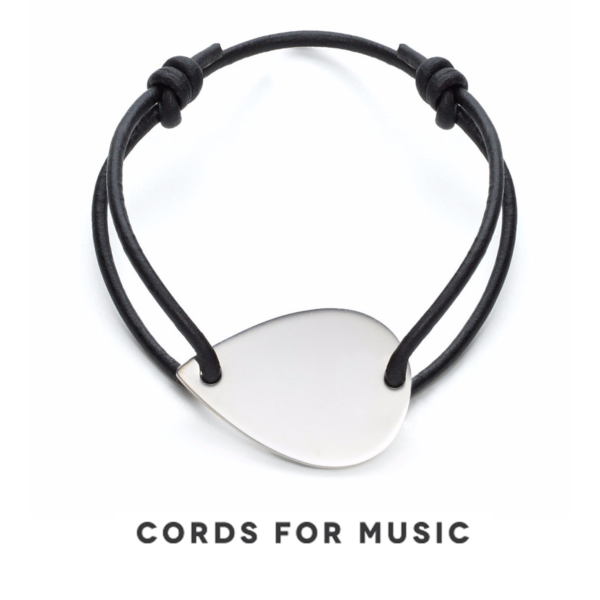 Cords for Music is a socially motivated jewelry line that gives a portion of its proceeds from each product sold to funding Education Through Music’s programs. Inspired by the magic of Rock and Roll, the Pick Cord is shaped like a guitar pick and attached to the wrist using waxed cotton cord. It is made in America of sterling silver. Ten percent of sales benefit Education Through Music.